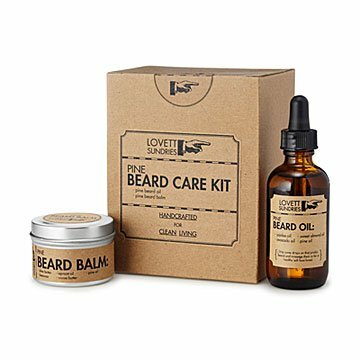 Keep your 'stache and beard in top-notch form with this all-natural facial hair care set. A well kempt beard can send you straight into the cool zone. But let it get grizzly and it's not so dapper anymore. This two-piece kit keeps facial hair healthy and moisturized. Including all-natural jojoba and sweet almond oil and shea butter balm, you (or your spouse will keep beards smooth and in check. Give the set to a moustache, goatee, or stubble sporting friend, and they'll be the envy of every hipster bartender in town. Made in Pennsylvania. He liked it a lot! My boyfriend decided to grow a beard as a personal experiment! I wanted him to have a great experiment, regardless of his end decision. When I found this product, I thought it was ideal for the occasion. He has been using and so far, so good! He wears a beard as is the current style. He loved the gift! It smells very masculine and wonderful, plus it makes my boyfriend's beard silky smooth.